Del Rey asked Dan and me to write a STARFIST special operations spin off. A new kind of unit, new situations, new characters. We said "Sure, glad to." But what kind of "Special Operations" units do the Marines have? Marines have always conducted a variety of special operations. Actually, it wasn't until World War I that the US Marines began fielding regiment and larger size infantry units. During World War II, both the US and the Royal Marines fielded special units; the British had "Commandos," the US Marines had a couple of Raider battalions--and "Para-Marines." Following WWII, the Royal Marines only had Commandos, sort of like the US army's Special Forces, only with more teeth, but they could no longer field larger units. The US Marines disbanded both the Raiders and the Para-Marines during the course of the war and retained their larger units. In Vietnam, we had the Combined Action Program, which I served in. CAP was disbanded during the Marines' withdrawal from Vietnam, but a version of it lives on in the Reserves as the Civil Action Groups. Could we do a STARFIST universe version of the Commandos, the Raiders, or the Para-Marines? Not really, the Fleet Initial Strike Teams routinely conduct those kinds of operations. So what could we do? There's another Marine special operations unit: Recon. Marine Recon is a division-level unit, each division has a Recon Battalion. Among Marines, Recon is looked up to as badder than the bad, and many Marine infantrymen (and others) aspire to be tough enough to serve with them. But Recon's function is to conduct reconnaissance and gather intelligence for division operations. We'd need more than that to write a series. Fortunately, there's another Recon at Fleet Marine Force level: Force Recon. If Recon is the baddest of the bad, then Force Recon is the baddest of the baddest. Marine Corps Force Recon conducts reconnaissance and intelligence gathering missions far behind enemy lines. Force Recon conducts small-unit raids on enemy centers of gravity far behind the lines. Force Recon runs... Well, let me put it this way: I know of missions Force Recon has run that I never had a high enough security clearance to know about. Yes, Force Recon is something we could write a series about. 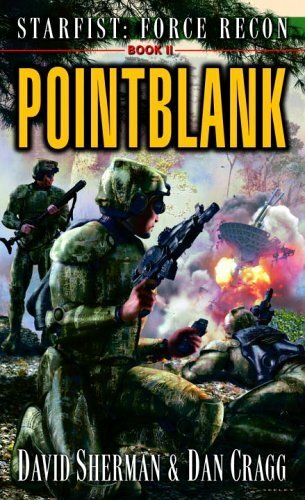 In Backshot, a Force Recon squad, led by Sergeant Jak Daly, conducts a reconnaissance mission for an army division on a peace-keeping mission--a mission the army doesn't believe anybody can accomplish. Then second platoon, Fourth Force Recon Company is sent on an Ultra Secret, Need-to-Know mission to the Balkanized world known as Atlas to resolve a perceived threat to the Confederation of Human Worlds. The Marines accomplish their mission, but at a price brought about by faulty intelligence--and the price the Marines pay in blood isn't the only price paid. Dan and I have, from time to time, dabbled with the politics of decisions to take military action. 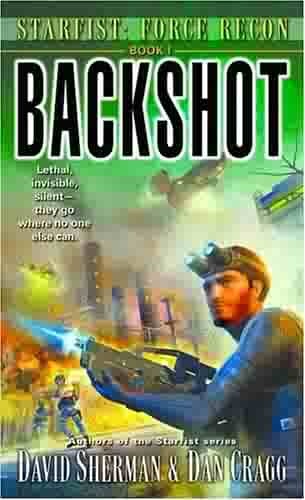 In Backshot, we go farther into the machinations than ever before--deeper and darker. Confederation forces are under siege on Ravenette. The Coalition rebels besieging them have been able to prevent the Confederation Navy from establishing its string-of-pearls satellite network, so the Confederation forces are operating blind to the enemy's forces, deployment, and plans. To deal with the situation, all available elements of Fourth Force Recon Company are dropped behind enemy lines. Their orders: destroy the enemy's ability to kill the string-of-pearls satellites; locate and assess the strength and morale of enemy units; conduct raids of opportunity to disrupt enemy plans and damage enemy morale. At the same time, Jak Daly, hero of Backshot, attends Marine Officer College on Arsenault. This book is in stores now. 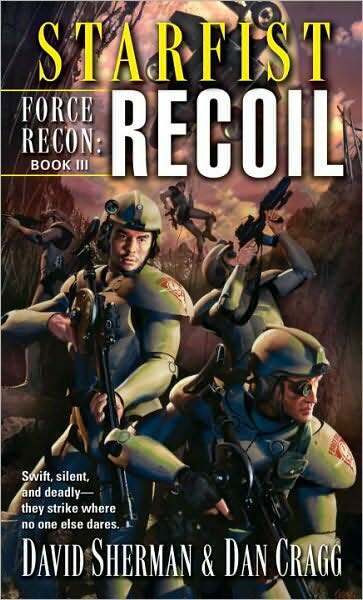 Recoil, the third Force Recon book. Skink fans, rejoice, your favorite villians are back! Newly commissioned Ensign Jak Daly and the two squads sent to the new colony called Haulover have no advance warning of what they're up against. They also have to deal with the untrusting "Board of Directors" that runs Haulover. Recoil is scheduled to be published in paperback on November 25, 2008.